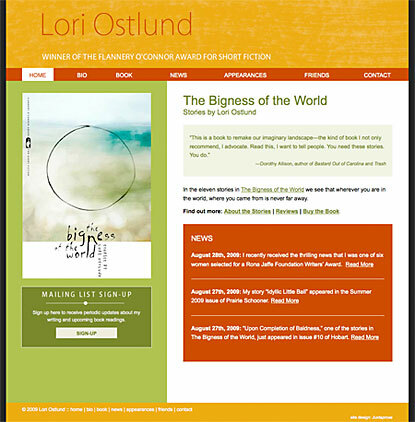 We've just launched a new site for author Lori Ostlund. Lori's debut book is the collection of short stories, The Bigness of the World, which is a winner of the Flannery O'Connor Award for Short Fiction (2008). Lori has been great to work with, and we're excited to see The Bigness of the World when it becomes available in the next couple weeks. The book can be pre-ordered / purchased from your favorite booksellers via Lori's website. For us, one of the interesting aspects of Lori's site was in presenting a short story collection, as compared with the sites we've done for authors and books. This is something we looked at first in terms of both content strategy and information architecture—e.g., how much of the stories to present and how to organize them in a way that feels as simple as an excerpt from a (single story) book. For the information architecture between the book and excerpts, we were also able to use one of paradoxes of hierarchy on the web to our advantage: the excerpts exist at both a "deeper level" (level 3) of the site in conceptual terms, while being, in practical / interaction terms, flat (at the same level—level 2) as the rest of the book information. We often have to do things like this with author websites, as they grow from one to multiple books. And, in this case, we also designed the site to expand as Lori publishes new books—she is working on a novel now, in fact. So, in conceptual terms, when Lori adds a new book, The Bigness of the World will move from "level 2" to "level 3," and the excerpts from "level 3" to "level 4." But, again, we'll make some navigation changes that make that all flow more like a simple flat space (e.g., less clicks to get between all the book info, "deeper" info more visible at the main level). Of course, when it's time to actually make this kind of change, we'll review Lori's goals and needs for the site at that point, as there may be new requirements that come into being between now and then. This is also the first site we've done in a few months that uses Wordpress as the site CMS. I was wondering if was going to be hard getting back into Wordpress after such a stretch of working in ExpressionEngine. But, over the years, we've created so many custom templates for Wordpress—and used it so many times as a full-site CMS, that it was a bit like riding a bicycle where one never forgets. So, it was actually pretty fun for us doing another Wordpress site! And, of course, it's always useful to go between CMSs to get some perspective—beyond Lori's site, we are working now on three sites in ExpressionEngine, and we're also finishing-up a site in Joomla.